With the melodic call to prayer echoing through Dubai five times a day, and thousands of mosque minarets piercing the skyline, Islam’s influence is writ large across the city. To deepen your understanding of the world’s second-largest religion, pay a visit to Jumeirah Mosque, the only Dubai mosque that’s open to the public, and one of only a handful of mosques in the UAE that are open to non-Muslims. The best way to familiarize yourself with Jumeirah Mosque and glean insight into the Islamic faith is by joining a guided tour. Run by the Sheikh Mohammed Centre for Cultural Understanding, tours take place at 10 a.m., Saturday to Thursday—there’s no need to book in advance, but be sure to arrive by 9:45 a.m. to join that morning’s tour. This relaxed tour delivers a great introduction to the Five Pillars of Islam, and in keeping with the SMCCU’s ethos of "Open minds, open doors," guests are encouraged to ask any questions they may have about the region and religion, with no topic off limits. The 75-minute tour costs 25 dirhams (about $7) and concludes with water, dates, Arabic coffee, tea and Emirati pastries. Outside of these regular tours, private visits to the mosque can be arranged through the SMCCU. Or, if you’re traveling with 10 or more people, get in touch with the center to arrange a private group tour. Jumeirah Mosque is located on Jumeirah Beach Road in the chic neighborhood of Jumeirah 1. Built in 1976, the mosque is made of carved white stone in the medieval Fatimid style of North Africa and the Middle East, complete with fortress-like crenellations and carved archways. The first thing you’ll notice from the outside is the pair of minarets (towers) that soar above the building – it’s from the balcony of these towers that muezzin makes his call to prayer throughout the day. The mosque’s large central dome is surrounded by four smaller domes, each adorned with intricate stone carvings. Inside, the serene space is decorated in soothing tones of apricot, cream and duck-egg blue, with brass lanterns illuminating the central prayer hall and surrounding nooks. During the tour of Jumeirah Mosque, you’ll learn about the importance of the Qiblah, a semicircular niche in the wall that indicates the direction of the Kaaba, or The Cube, in Mecca. It is here that the Imam stands to lead prayers five times a day, and where up to 1,200 worshippers turn to pray. As this is a place of worship, dress rules apply. For women and men, shoulders and knees must be covered at all times, and your clothing should be loose-fitting and non-transparent. Ladies, you’ll also have to cover your head with a scarf—but don’t worry if you haven’t packed appropriate clothing; you can borrow traditional attire from the mosque. The SMCCU’s "Open mind, open door" policy extends to photography, with cameras allowed inside the mosque, making Jumeirah Mosque is the most photographed mosque in Dubai. While the cool white walls look great against a clear blue sky during the day, arrive at dusk for the most spectacular shots of the exterior. As the sun sets, the white stone transforms into a deep blush before melting into a soft golden hue. After nightfall, the mosque is lit from below to accentuate the stone carvings and elaborate details. After your morning tour of Jumeirah Mosque, take a five-minute stroll to Jumeirah Public Beach, where you can take a dip in the Arabian Gulf, and photograph the iconic Burj Al Arab, Dubai’s most luxurious hotel and one of its coolest architectural works. 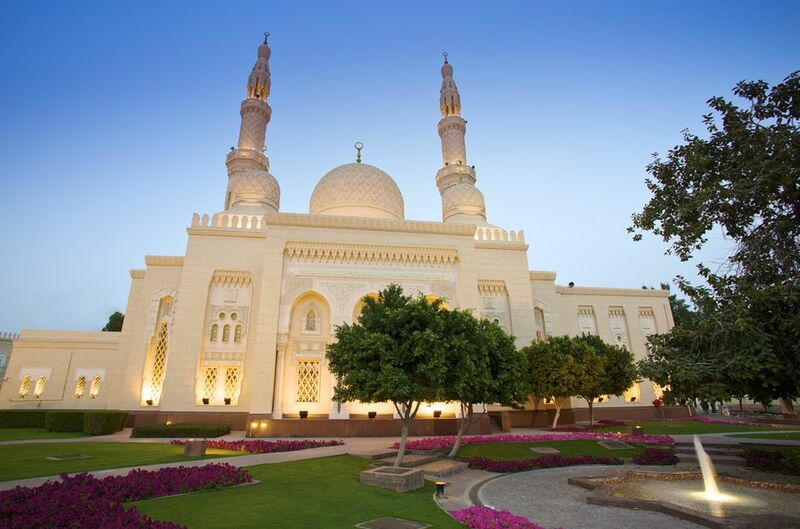 A 10-minute walk to the north, visit the Etihad Museum to witness the site where the United Arab Emirates was born. It was here in the Union House, in 1971, that the documents were signed to unify the Arab states. To refuel and shop for designer homewares, clothing and jewellery, take a 15-minute walk (or 5-minute taxi ride) south of Jumeirah Mosque to Comptoir 102, a hip concept store and café with a focus on handcrafted goods and wholesome organic food. Have a cultural breakfast or lunch at the Sheikh Mohammed Centre for Cultural Understanding, followed by a walk through Dubai Museum, both located in the historic Al Fahidi Neighborhood, a 15-minute drive to the north of Jumeirah Mosque.